What makes a great snow removal contractor? What should a commercial or residential buyer evaluate when choosing a snow removal contractor? Many snow removal contractors also perform green industry services like lawn maintenance, irrigation service and installation, arbor care or fertilizing in the warmer months. And they’ll tell you that the main difference between plowing snow and summer services is the urgency with which snow must be cleared. If you fail to remove snow from your local grocery store’s parking lot by their 7 a.m. open, you could very likely lose that contract the following year. One mistake can kill a long-term relationship. Forgetting to mow a lawn likely won’t kill a business as fast as failing to meet your snow removal contract terms. Which is why it’s so important for snow removal contractors to focus on communicating with their customers. I talked to a contractor who said the worst mistake a snow removal contractor can make isn’t forgetting to plow a property. The worst mistake a contractor can make is forgetting to plow a property and then compounding the error by not knowing why or when the customer calls to complain. Don’t forget the power of a good old-fashioned phone call. 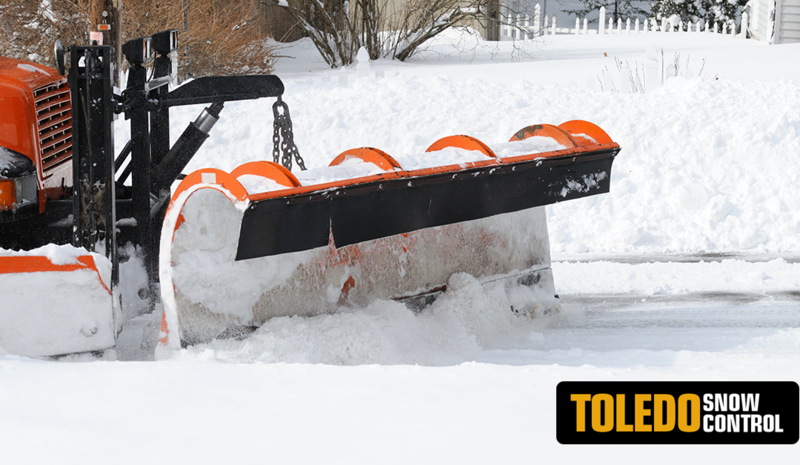 You can call Toledo Snow Control and track snow removal in real time. There’s always more than one way to get a job done. Snow plowing is the same, especially on a large commercial property. There are so many tools you can use – from a simple shovel to a skid steer. Many people make the mistake of looking at price instead of productivity. It could take a guy with a small UTV 5 hours to plow the same area that a larger, more efficient piece of equipment could plow in 1 hour. So if a contractor is charging $100 an hour for the UTV and another charges $400 an hour for a large plow, the large plow is actually the better choice because it’s more efficient. And it may be more profitable for the contractor as well, because his margin on that UTV is much less than his margin on that large plow. Since most snow falls in the evening and is cleared in the wee hours of the morning, timeliness is important. Businesses rely on snow removal contractors to have their lots clear of snow and ice in time for their business to open. Residential customers expect to be able to get out of their driveway in the morning for work. So it’s vital that you minimize the time spent on each property and work quickly to do the job. If you don’t, you run the risk of missing a deadline and incurring the wrath of a customer. Attention to detail is vital to satisfying your customers. You need to constantly think about logistics – where’s the best place to push the snow? How can we minimize disruption and keep key driving lanes clear? How can we ensure we don’t damage a property? How can we keep ice from building up on a property? These are questions your contractor should be asking. Though snow events are, for the most part, unplanned events, a huge amount of planning and preparation goes into pushing snow. If you don’t have a well-considered (and well-communicated) plan, you may find yourself losing business.